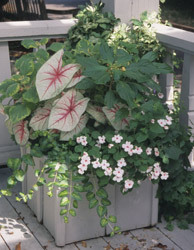 Think of a container garden as a living flower (and foliage) arrangement with roots! What look do you desire? Are you interested in something harmonious, dramatic or soothing? For a long period of enjoyment, keep the plants looking attractive by making sure the roots are healthy, and the foliage receives the light it needs to make its own food. 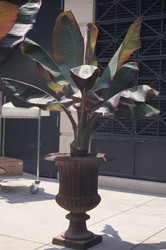 Just one kind of plant in a container is the simplest to maintain. Plants that thrive in like soil, watering, and light conditions make successful combinations. When combining plants, size, texture, proportion, color, setting, and lighting all play a role.